In the early 1900s, John Walter Christie built a series of front-wheel drive automobiles; each had its inline, four-cylinder engine mounted transversely between the front wheels. The engine’s crankcase also served as the vehicle’s axle. With only so much room between the wheels, the bore of the engine’s cylinders was limited, and Christie found that other cars were producing more power and outperforming his. In late 1905, Christie devised a way to increase the capacity and power of his engines by using a V-4 configuration. 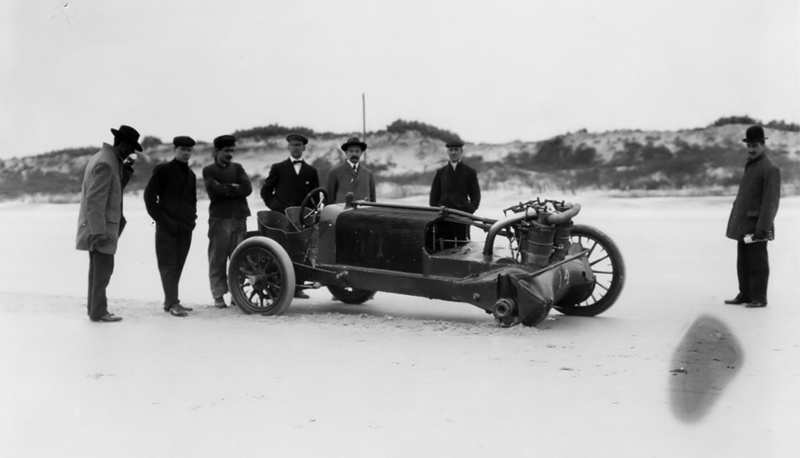 J. Walter Christie’s 1906 racer after hitting debris on Ormond Beach, Florida in January 1906. Note the exhaust manifolds on the front of the engine, the original cylinder water jackets, and the lack of a radiator header tank. The induction pipe can be seen behind the engine. 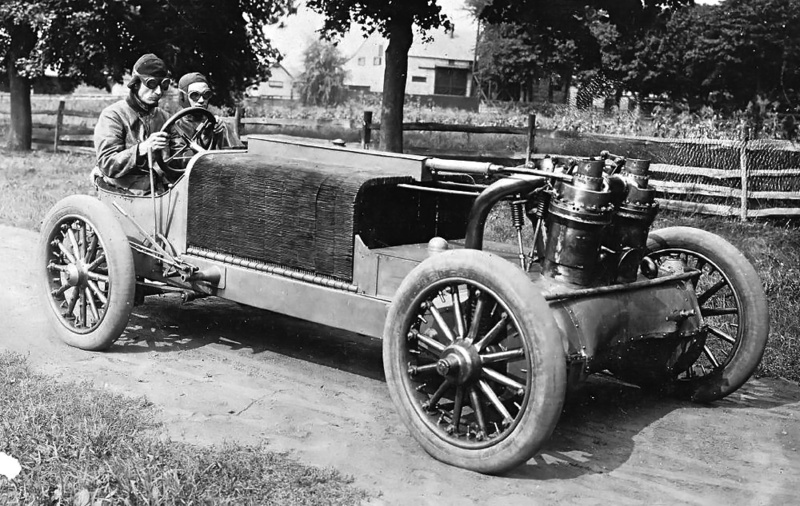 After the Vanderbilt Cup race in October 1905, Christie took his 1905 racer, with the 828 cu in (13.6 L), 70 hp (52 kW) inline engine, and modified it with a new V-4 engine. Essentially, the axle of the 1905 racer was reworked to accommodate four individual cylinders. The car maintained its normal (high-speed) gear and low forward and reverse gears. The drive wheels were coupled to the crankshaft, and wheel slip was limited in the normal gear. For low gear and reverse gear, a five to one reduction was employed, and the drive wheels were allowed to slip relative to one another. The individual cylinders were arranged in two rows and were staggered to keep the engine compact. The cylinders were mounted to the top of the axle, and the angle between the rows was around 22.5 degrees. The carburetor was placed low and behind the engine. The air/fuel mixture traveled from the carburetor and through a large pipe to the top center of the engine. Attached to the end of the pipe was an intake manifold with four outlets to provide the incoming air charge to each cylinder. The air/fuel mixture flowed into each cylinder though a single intake port that led to a chamber ringed around the outer cylinder head. In this ring were eight 1.5 in (38 mm) atmospheric (automatic) intake valves. A single spark plug was positioned below the inlet valve chamber ring. Christie behind the wheel of his racer at Ventnor Beach, New Jersey in April 1906 . The car had been modified with short exhaust stacks, redesigned cylinder water jackets, and a header tank above the radiator. It was here that Christie set a four-cylinder automobile speed record by covering a mile in 35.2 seconds (102.3 mph / 164.6 km/h). At the center of the induction ring but separate from it was a single 3.125 in (79 mm) mechanically operated exhaust valve. The exhaust valve was controlled by a rocker arm actuated by a pushrod. The pushrods were driven from a camshaft situated behind the second row of cylinders. Originally, the exhaust valve was enclosed in a housing that had an exhaust port on its side. Each cylinder had its own exhaust manifold attached to the port; this configuration was replaced by a short exhaust stack that extended from the top of the cylinder. The steel cylinders were originally surrounded by electrolytic (oxygen-free) formed copper water jackets. However, these jackets were prone to leaking and were replaced by jackets made of sheet metal. Water from the radiator entered the water jacket of each cylinder near its bottom. The water flowed out the top of each cylinder and into a common manifold that delivered it back to the radiator/header tank. The radiator was the same originally used with the inline engine in which copper tubes 5/16 in (8 mm) in diameter and 64 in (1.63 m) long were bent into an inverted “U” shape, extending from one side of the vehicle to the other. A header tank was later added above the middle of the radiator. Later still, the header tank was integrated into the middle of the radiator. 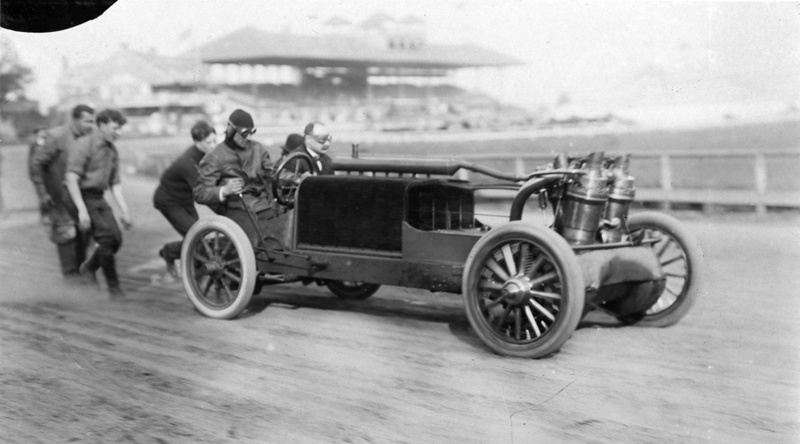 Lewis Strang push starting Christie in the 1906 V-4 racer at the Empire City Race Track in May 1906. On this track, Christie tied the then-current mile-track record of Barney Oldfield at 53 seconds (67.9 mph / 109.3 km/h). The racer is shown with an eight section radiator. Sources disagree on the engine’s size, the engine’s power, and the car’s weight. Some sources list the engine as having a 7.375 in (187 mm) bore and stroke and a total displacement of 1,260 cu in (20.7 L). Other sources give a 7.5 in (191 mm) bore, a 7.0 in (178 mm) stroke, and 1,237 cu in (20.3 L) total displacement. The engine’s output varies by source between 100 to 135 hp (75 to 97 kW), but 100 hp (75 kW) is probably close to the correct figure. The car’s reported weight varies between 1,800 and 2,150 lb (816 to 975 kg). The crankshaft was 2.75 in (70 mm) in diameter and made of chrome steal. It was most likely a two-throw crankshaft supported by three main bearings. This would mean two connecting rods were attached side-by-side to one crankpin. The engine is said to have weighed 470 lb (213 kg). 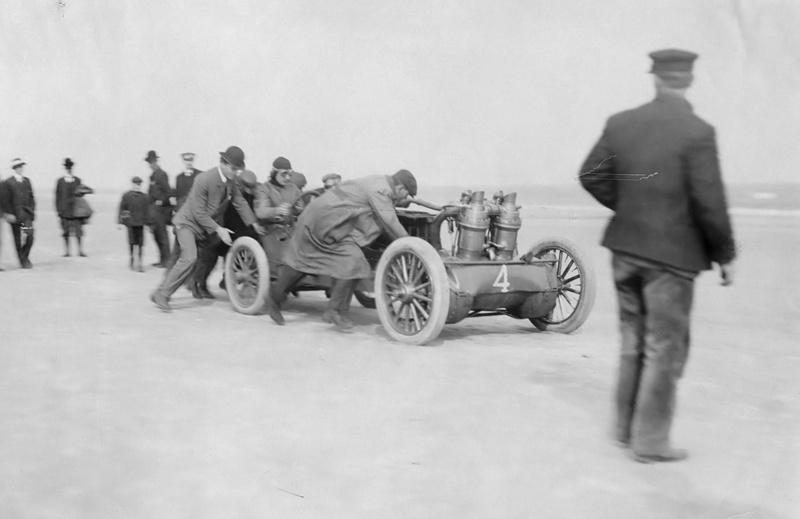 Christie’s V-4 racer made its debut at Ormond Beach (north of Daytona Beach), Florida in January 1906. The car was numbered 14 for this event and experienced several issues. The right front wheel broke off after the racer struck some debris on the beach during a practice run. The car was repaired, but the copper water jackets leaked, and the car had engine cooling issues. Christie had to stop and refill the radiator with four miles left in the 30 mile race. Christie went on to finish the race in 37 minutes and 24.6 seconds, averaging 48.1 mph (77.4 km/h). The car’s next appearance was in April at Ventnor Beach, near Atlantic City, New Jersey. The racer was now numbered 4 and was modified with new cylinder water jackets, open exhaust stacks, and the header tank above the radiator. Christie covered a mile in 35.2 seconds at 102.3 mph (164.6 km/h), making the racer the fastest four-cylinder automobile in the world. In May, Christie lapped the mile track at Empire City (Yonkers, New York) in 53 seconds (67.9 mph / 109.3 km/h). This speed tied the mile-track record held by Barney Oldfield. Christie (at the wheel) and Strang ready for the Vanderbilt Cup race. Note the new header tank and the ten section radiator. Also visible are the springs on the pushrods that held the exhaust valves closed. By September 1906, Christie had readied his V-4 racer for the Vanderbilt Cup. The car now had the integrated header tank installed, and the radiator had ten sections rather than the eight sections used earlier. George Robertson was to drive the car for the Vanderbilt Cup, but he crashed it during a qualifying run on September 15. The damage was not too severe, and Christie made the repairs that night. However, Christie did not notice that the steering arm had been cracked in the accident. On the morning of 16 September, Christie and his riding mechanic (and nephew) Lewis Strang took the car out for a test run. As the car quickly gained speed, the steering arm failed and Christie lost control of the racer. The car smashed into a telegraph pole and was too damaged to be repaired. Fortunately, Christie and Strang were not injured. The pair went on to race in the 1906 Vanderbilt Cup in a converted touring car that the Christie Direct Action Motor Car Company had built. After the race, Christie went to work on his next racer; he had already set his sights on putting his front-wheel drive cars on the international stage. 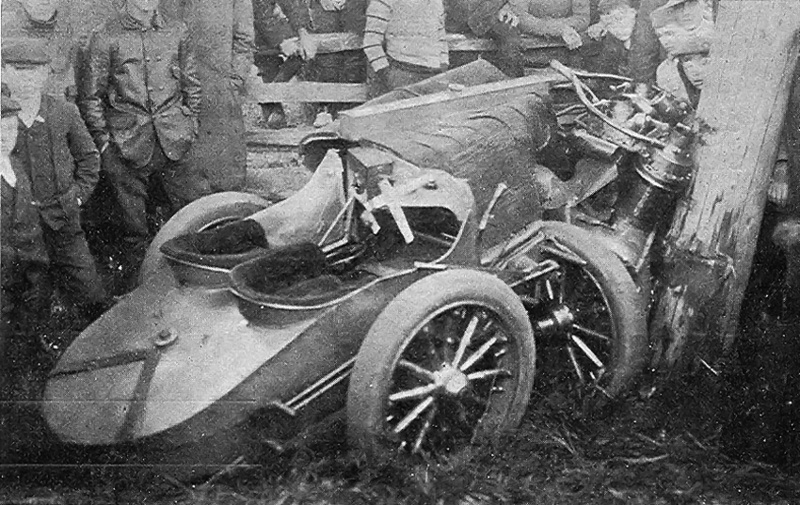 The destroyed Christie 1906 V-4 racer after the steering arm broke on 16 September. Note how the steering wheel was broken in the accident. Fortunately, Christie and Strang were not injured. This entry was posted in Automotive on 23 November 2014 by William Pearce.